Fabulous Karen millen white shirt blouse size 14 with long sleeves. Flattering cut, cool flowing style. Great condition. KAREN MILLEN Ladies blouse, size 12, very classy... black with pattern . KAREN MILLEN Designer ladies,v neck top with ruffle down the front and a belt attached to one side, with zip up side. Looks fantastic with black jeans, & heels. A lovely classy black, with a green leaf design printed on the top. 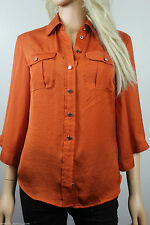 KAREN MILLEN Ladies Top. Soft Ivory colour. Short Sleeve attached to shoulder placket with silver colour pointed stud beads. Back shoulder yoke is see through. Black & white striped top with yellow neon flash. Longer panel at back. Material: Main body: 71% viscose, 29% polyester. Contrast (rear white panel) 100% polyester. Unusual funnel/roll neck with draw string detail. In excellent condition. KAREN MILLEN BLACK/WHITE STRETCHY PEPLUM HEM TOP. UK SIZE 10.
ladies Designer Top. Condition is Used. Dispatched with Royal Mail Signed For® 2nd Class. KAREN MILLEN JACKET. SEQUINED ALL OVER. MIDNIGHT BLUE. ARMPIT TO ARMPIT IS 36" LENGTH IS 18" FROM TOP OF SHOULDER TO HEM. PLEATED 3/4 SLEEVES. It features a crew neckline and has a zip fastening. It is made from an ivory coloured material and would be ideal for different occasions. Style: Blouse. Main Colour: Ivory. Colour: Ivory. Gender: Ladies.